The National Council of Churches in the Philippines (NCCP) laments with the people, most especially with the poor and marginalized who continue to experience the many forms of death in their everyday lives. We bring these concerns before our member churches and the public for prayer, reflection, and action. Furthermore, those engaged in defending human rights including the right to a safe and healthy environment have experienced increased levels of threat, harassment, intimidation and even extrajudicial killing. Human rights groups have documented 163 victims of political extrajudicial killings among other rights violations. The militarization of rural communities has resulted in the evacuation of nearly half a million Filipinos, the most recent of which was the displacement of our Lumad brothers and sisters in Surigao del Sur. Particularly disturbing is the government’s vilification of churches and church-related organizations, including foreign missionaries. We are horrified at the recent killings of church people including Roman Catholic priests. There is also the unjustified detention and trumped-up charges against workers and partners of the Visayas–Mindanao Regional Office for Development of the Iglesia Filipina Independiente (VIMROD-IFI) during a meeting on Lumad issues at the Mother Francisca Spirituality Center in General Santos City. The NCCP asserts that the Christian church has both a calling from God and a social responsibility to speak out in condemnation of wrongdoing and in defense of the most vulnerable. We are concerned that the recent attacks against priests,pastors and missionaries of Christian churches are an attempt to silence our legitimate right to exercise our prophetic voice. 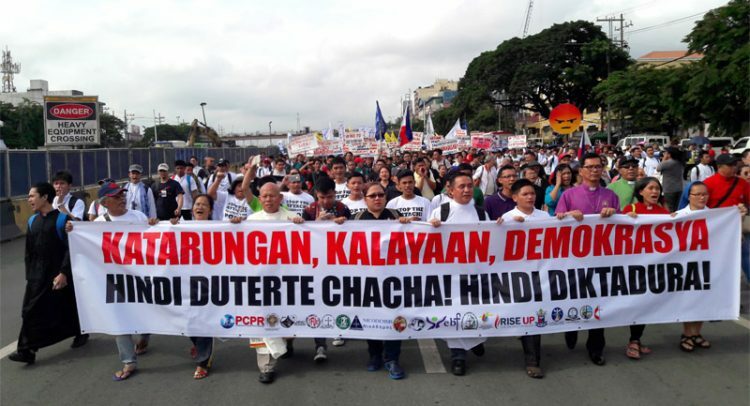 We are also deeply saddened by the government’s unilateral suspension of the peace talks with the National Democratic Front of the Philippines (NDFP), especially at the very point where both parties were on the verge of working towards agreements in social and economic reforms that could have addressed the root causes of un-peace in our land. The NCCP is greatly concerned by the deteriorating economic conditions of ordinary Filipinos, as most recently evidenced with the regressive tax provisions of the TRAIN law. Rising prices, inflation, and the deteriorating value of the peso combined with widespread unemployment have thrown millions of families deeper into poverty. We are also concerned about the failure of the government to deliver on its commitments to end contractualization. The NCCP calls member churches to remain vigilant in the defense of our freedoms, to seek the light of Christ within whose presence no lie or wrongdoing can endure, to continue to be faithful in prayer for our nation and president and to be active in works of love, especially among those in our society who are most vulnerable and in need. We call on the government to uphold human rights and civil liberties, to work for peace, and to defend the dignity and sovereignty of the Filipino people. May God enlighten our leaders, especially the President, and may he deliver the true situation of the people and the state of the country in his SONA.